Posted on June 19, 2018 by Ching under Events, Family, Zumba. 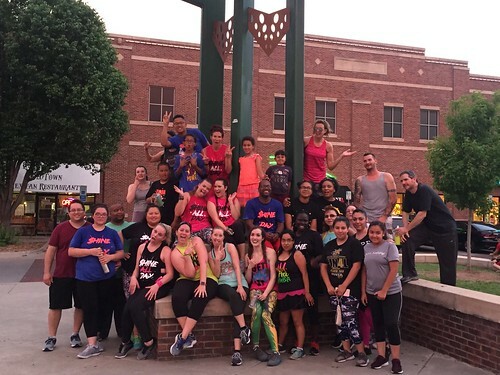 At least we were able to stop by for the “Zumba in the Square” event last month. They had another one on Saturday, which we missed altogether because we were getting ready for Brian’s birthday party at the house. 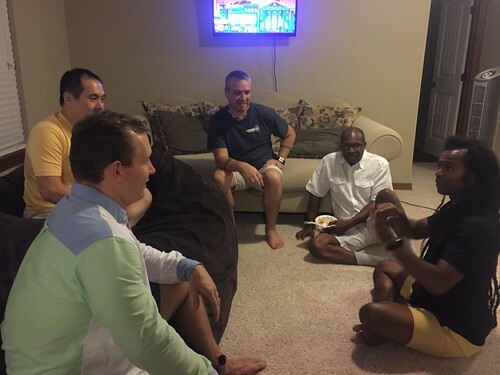 We hosted it on Saturday, the 16th, because Brian’s birthday fell in the middle of the week and we couldn’t celebrate with friends the weekend before because we were Rosalia Ranch for Symphony in the Flint Hills (more on that next time). As far as Brian’s birthday get together on Saturday, I didn’t take a lot of pics. Brian doesn’t really like having HUGE parties so we just had a few people over for pork and chicken street tacos. Others also brought food to share. A few people went to do “Zumba in the Square” first and then came over. We kept it pretty casual because we knew we would be playing games and also we wanted people to come straight over from “Zumba in the Square” and not have to change clothes. However, there were two couples who went above and beyond. 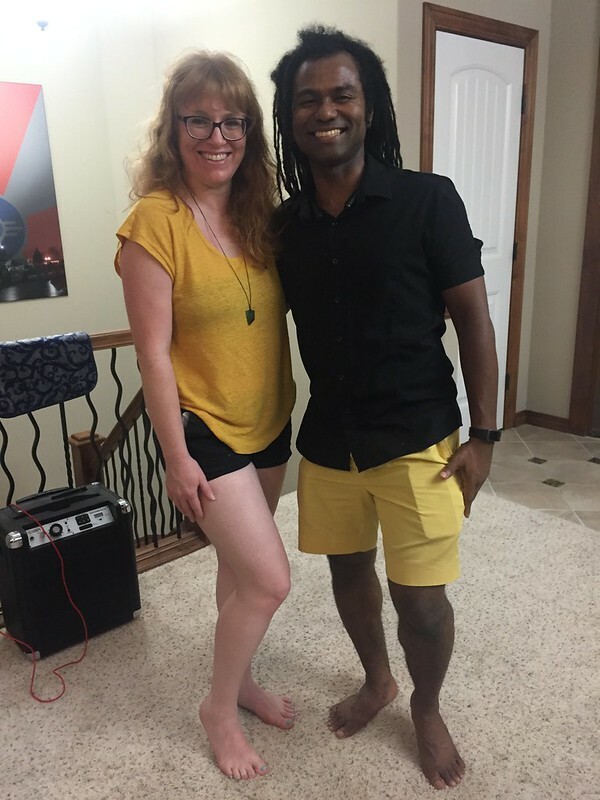 Amy and Hideki showed up in coordinating outfits in Wichita State colors. 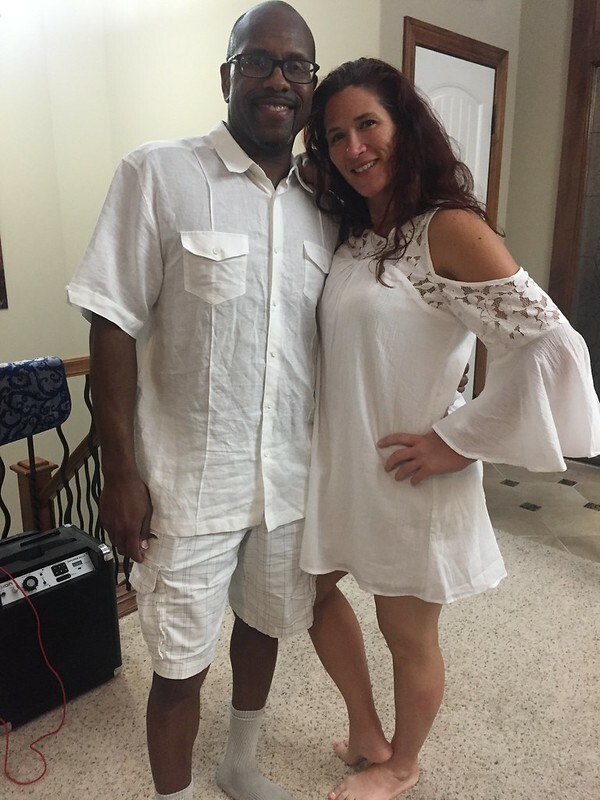 Todd and Missy did the all white thing. Both couples looked fabulous. We had a lot of fun playing Disturbed Friends and Just Dance and just hanging out and visiting in general. It was a great birthday celebration overall but we’re not quite done yet. We are celebrating again this coming weekend. Brian’s parents are coming up from Oklahoma so we can do our traditional joint celebration. We usually celebrate Brian’s birthday, grandma’s birthday (which is today, by the way — Happy birthday, Grandma! ), and Father’s Day all in one go. That celebrating is happening this Saturday. We’re going to have a BBQ/cookout and this event will be family only. I think that might be it, though, I wouldn’t be surprised if we come up with another celebration in honor of Brian’s birthday. The two of us have been celebrating all month long. We had a couple of dinners for just the two of us (Carrabba’s and Bonefish, two of our favorite restaurants). Then we spent a weekend volunteering at Symphony in the Flint Hills on Friday and then attending the event the next day. Then Brian got his latest Stitch Fix box (new birthday clothes). Then Brian got a new watch band and protector. Then he got a deluxe massage from Mindy (his favorite massage therapist) at Sveta’s. Then he got a Smove (basically a new toy to play with) but this was more my idea. LOL. It’s not a milestone birthday but I sure hope it’s been a really good one!